Katherine Applegate invites us into a world narrated by the wonderful Ivan. Mighty Silverback. Star of the Exit 8 Big Top Mall. Ivan is so much more than an oddball mall attraction. 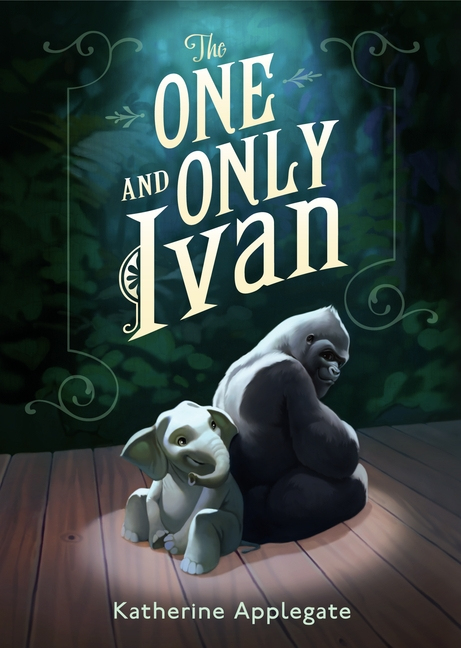 He narrates this story and The One and Only Ivan tells the story of his life. Ivan’s story is one of relationships. It is about Stella and Ruby, important elephants. About Bob the dog who is wise and aloof. And little Julia who inspires and understands Ivan’s art. This may be a story mostly about animals but I haven’t read something in a long time that so reminded me of my humanity. How we are all vulnerable. Raw. Hopeful. Somewhat scared. Read along with us and give the gift of this book to yourself. Book Club! Welcome to our second book of the 2012/2013 year! Your enthusiasm for this new book was contagious today! Read up to at least page 90 and we will meet and discuss next week 🙂 We cannot wait to hear what you have to say about Ivan. Feel free to share your comments and questions on this page before our “official” meeting. Happy reading! This is such a good book! Ms. Gelson why do you have to choose books that make me cry? AWESOME BOOK! Hi Ms. Gelson soooo sorry for not coming to bookclub but I finished the book and it was as great an ending as Id though it would be sorry again for forgetting about bookclub! Jena – Not a problem! We know you have lots of booklove! So glad that you loved the book! Great meeting today to discuss how much we all enjoyed this story and how you have all been passing the book around in your families and to friends. Hoping Alyson shares her story of talking books with everyone on the plane! My aunt read the entire book on the plane and is getting it for her niece. The girl across from me had read the book and I recommended Out of my Mind to her (our other Book Club book). Alyson It sounds like you are doing an amazing job of spreading your love for books! Did your Dad like this title also?